The debut of the new, large-format monthly comic-book extravaganza created, written, and drawn by comics superstar Barry Windsor-Smith. The special 40-page premiere introduces the three original series that will appear in every issue! 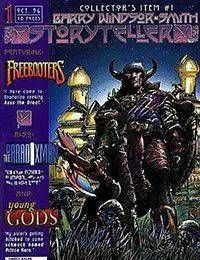 The Freebooters recounts the quest of young Aran Ana-Kashan through the worlds of sword and sorcery to enlist the aid of Axus the Great, proclaimed mightiest hero in the world, in a desperate attempt to avoid global cataclysm. The retired Axus, however, has other plans. The series for which the fans of Barrys original Conan and Archer and Armstrong have been waiting! The Paradoxman follows Tristan Caine, an unwilling time traveler, as he is buffeted about the ages on the fractious TimeBike. Caines encounters with everything from dinosaurs to space aliens begin to add up to a very disturbing Big Picture. Young Gods introduces a pantheon of mythic stature on the eve of the wedding of Heros, Son of All-Worlds, and the stunning Celestra, Princess of Orgasma; a marriage meant to unite the most grand and powerful worlds of Gods. Never has a case of cold feet had such intergalactic repercussions!